While on a mission to bake some filling and healthy snacks for my 12 year old son to take to school, I’ve made an awesome discovery. You see, I got distracted while making these cookies and it wasn’t until they were baked that I realized that I had left out the sugar – with delicious results. These cookies are so full of everything good, that the omission of sugar turned it into a salty, savory confection instead of a sweet one. 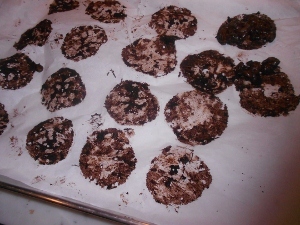 The recipe is from Maida Heatter’s Book of Great Desserts, where she writes that she made these cookies for a health-food store in Miami Beach until the demand become more than she could handle. I will give you the recipe as it was originally written. Adjust rack to top position in the oven. Preheat oven to 350 degrees. Cut aluminum foil to fit cookies sheets. Do not grease. Combine flour, baking powder, salt, cinnamon, and ginger and use a strainer to strain into a very large bowl. Add the raisins, and toss till they are coated with flour. Add the walnuts, pecans, pignolias, peanuts, sunflower seeds, sesame seeds, wheat germ and rolled oats or oatmeal. Mix together and set aside. In a mixing bowl, cream together the butter and peanut butter. Add the sugar and beat well. Beat in the eggs and the milk, scraping the bowl with a rubber spatula as necessary. Pour over the flour-nut mixture. Stir with a heavy wooden spoon or spatula or mix with your hand, until the dry ingredients are completely absorbed. Make these large. Place by 1/4 cupfuls 2 1/2- 3 inches apart on the foil. With the back of a spoon, flatten the cookies to about 3/4 inch thickness. 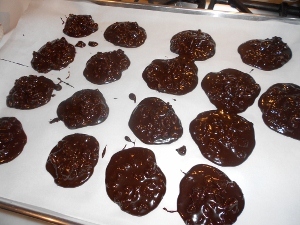 Bake 18 minutes or until cookies are lightly browned and semi-firm to the touch. If necessary, reverse position of cookie sheet during baking to insure even browning. Use a wide metal spatula to transfer cookies to racks to cool.